Walter Kempowski’s final novel is encapsulated in these two questions. They sing an existential refrain throughout the entire text, like the chorus of a song. Faced with an uncertain future, Kempowski’s characters try to cling to fragments of the lives they once knew. A fractured, modernist narrative, All For Nothing is all at once a history textbook, a Shakespearean tragedy and a traditional German fairytale; and, like all good fairy tales, it begins gently, with a castle and a princess. The Georgenhof estate has seen better days, but the wide-eyed visitors to the manor house still gape at the ‘castle’ in amazement. Behind its walls, Katharina von Globig, a “languorous beauty, black-haired and blue-eyed”, her blond son Peter and their household have weathered the long years of the war in relative peace, sheltered from its true dangers and deprivations. Katharina’s tower is her private apartment in which she locks herself; a place of refuge rather than a prison, from which she can survey the snowy tracks of the ‘big bad wolf’, Drygalski the Nazi official, as he prowls around outside. In true fairytale fashion, Katharina is generous to those less fortunate, donating her old clothes to the Ukrainian girls who work in the kitchen and feeding the multitude of hangers-on who steadily make their way to the estate looking for handouts: the political economist on his crutches, the violinist and the one-armed soldier who plays piano. Each receives a warm welcome, but we soon learn that the world will not repay Katharina for her kindness. In the waning months of the Second World War, one visitor arrives who will upset the quiet lives of the aristocratic von Globig family. Like the handsome prince, he battles through a hedge of thorns and climbs the princess’s tower – but he does not come to rescue her. There is no single focal character in Kempowski’s work. With his use of short paragraphs – never more than thirty lines or so – and free indirect discourse, he gives us an insight into every character’s thoughts and feelings, then whisks us away before we can get too involved. We are not meant to identify only with the von Globigs, but with everyone and no one. There are no heroes or villains here, despite the fairytale allusions. No one is good or evil; instead, everyone is painfully human, with the full complement of human failings. Even Drygalski, the enthusiastic party member, is shown to have his caring side. The overarching theme of the novel is ultimately loss. Loss of life, of home, of history, and of sympathy for others. Every character we meet is trying desperately to hold on to something from the past in the face of an uncertain future: the baron with his manuscript detailing his home town, the teacher lamenting the loss of his Stone Age tools, and the tutor who wishes to relive his youth by constantly retelling the same anecdotes. Desperation has blinkered everyone to the plight of others, and Katharina is the only one who seems able to retain her generous nature, but it is this which leads to her eventual downfall. For this is no true fairytale – there is no happily-ever-after here. As the story gears up to its tragic conclusion, Kempowski continues to relate events in the same clean, rational prose in which he began. Death and dismemberment are described with a grotesque detachment that drives home the inability of words to truly convey the horrors of war. 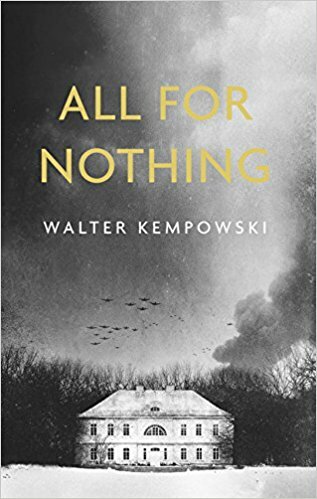 Drawn both from his own experience and the first-hand accounts of others, All For Nothing is a fascinating and horrifying glimpse into the past.